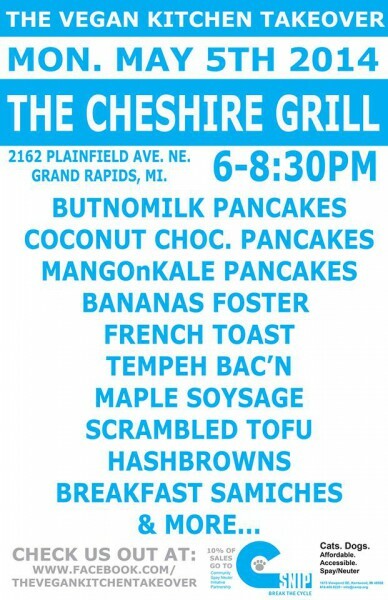 The Cheshire Grill, located at 2162 Plainfield Ave NE in Grand Rapids, will be kidnapped by vegans on Monday, May 5. The Vegan Kitchen Takeover will put Chefs JR and Justin in charge, recreating the Cheshire Grill’s breakfast menu favorites in vegan and/or gluten free form. A portion of proceeds from the event will benefit C-SNIP, West Michigan’s local non-profit spay/neuter resource for the past 13 years. With more than 100,000 surgeries performed, C-SNIP (Community Spay Neuter Initiative Partnership) relies on grants, donations, and now restaurant takeovers to help fund care for the up to 12,000 dogs and cats it serves every year. 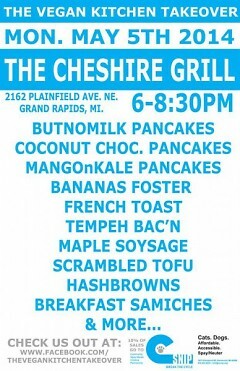 Breakfast for dinner will be served from 6PM to 8:30 PM, with reserved seating by ticket. Tickets are now available at www.csnip.org or www.facebook.com/TheVeganKitchenTakeover. Snippy, the C-SNIP mascot will be making an appearance and C-SNIP volunteers will be on hand to answer questions about affordable spay/neuter and how to make an appointment at the clinic located at 1675 Viewpond SE in Kentwood.